Examples of such confined area on board are : · boiler, pressure vessel, cargo, ballast, fuel oil, or lube oil tank, cargo holds, void space, or similar type enclosure. i) Limited openings for entry and exit: Confined space openings are limited primarily by size or location. Openings are usually small in size, perhaps as small as 450 mm (18 inches) in diameter, and are difficult to move through easily. Small openings may make it very difficult to get needed equipment in or out of the spaces, especially life-saving equipment when rescue is needed. However, in some cases openings may be very large, for example open-topped spaces such as ships' holds. Access to open-topped spaces may require the use of ladders, hoists, or other devices, and escape from such areas may be very difficult in emergency situations. ii) Unfavorable natural ventilation: Because air may not move in and out of confined spaces freely due to the design, the atmosphere inside a confined space can be very different from the atmosphere outside. Deadly gases may be trapped inside, particularly if the space is used to store or process chemicals or organic substances which may decompose. There may not be enough oxygen inside the confined space to support life, or the air could be so oxygen-rich that it is likely to increase the chance of fire or explosion if a source of ignition is present. iii) Not designed for continuous worker occupancy: Most confined spaces are not designed for workers to enter and work in them on a routine basis. They are designed to store a product, enclose materials and processes, or transport products or substances. Therefore, occasional worker entry for Survey, inspection, maintenance, repair, cleanup, or similar tasks is often difficult and dangerous due to chemical or physical hazards within the space. A confined space found in the workplace may have a combination of these three characteristics, which can complicate working in and around these spaces as well as rescue operations during emergencies. 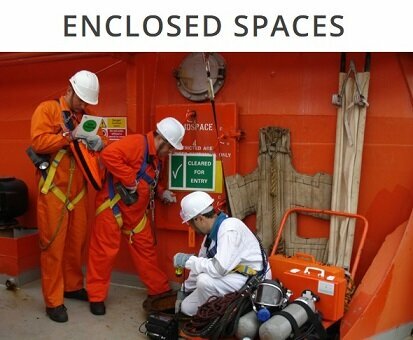 It must be remembered that "enclosed spaces" relates not only to tanks, cofferdams, chain lockers, storerooms, etc., but also to cargo holds and adjacent spaces, thus potentially presenting similar dangers. It cannot be emphasised too highly that certain cargoes will deplete oxygen and/or emit toxic gases or fumes. While some of these will be obvious (e.g. certain solid and liquid chemicals), others are less obvious (e.g. scrap metals [see IMSBC Code], logs and other timber products). Additionally, a grain cargo that has been subject to fumigation (either prior to or during the voyage) may still have a toxic or oxygen- depleted atmosphere on arrival at the discharge port and entry to the hold should not be permitted until it has been properly ventilated and the atmosphere tested. Other spaces that might be similarly affected include containers that have been carried under fumigation, deep tanks after discharge, containers that have been refrigerated with liquid Nitrogen, Carbon Dioxide or other refrigerant, and spaces that have recently held dangerous goods, etc. As noted above, certain cargoes can also cause toxic gases and/or oxygen depletion in adjacent compartments and even on the open decks with deaths being attributed directly to this contaminative affect. Personnel should be aware that recent incidents have involved oxygen depletion in near-empty tanks carrying vegetable oils apparently caused by the temperature of heating coils reaching a sufficiently high level to generate carbon monoxide from the reduced quantity of oil in the tank. Appropriate precautions should be taken when planning to enter such tanks. All enclosed spaces, including cargo holds, must be checked for oxygen content prior to entry. In the event of a casualty, it is essential that any attempt to rescue personnel from a cargo space should only be carried out by trained and supervised personnel using the correct equipment suitable for entry into that space, especially if oxygen depletion is suspected and breathing apparatus is required. On no account should any rescue personnel enter a suspect space without the necessary equipment­such action will only serve to exacerbate the problem and result in further casualties. The IMO "Recommendations for entering enclosed spaces aboard ship" will be found as Appendix 5 of the CSS Code and in the Supplement to the IMSBC Code.